This one's just for fun. Sometimes you have to just stamp for fun! My brain sometimes hurts from too many challenges - not that I don't enjoy them, but once I start feeling like I have no ideas left, I have to just play around and come up with something on my own (or, as in this case, inspired by Pinterest). Of course I couldn't just leave it all black, grey and white like that, could I? LOL! love it!! such an interesting card to look at. I hear you about the challenges...my brain gets tired plus I don't have much extra time. Love your snowflake card Ardyth, the colour behind the circles adds so much interest. Fabulous!! Really draws your eyes in for a closer look at each circle. Funky snowflake card! I like how the snowflakes are offset. I probably would have stopped at monochrome!! But I like your added colour. This is so cool! Love the color. I truly, honestly, really enjoy coming to your blog. EVERY time you go and create something I haven't seen before, and I just love that about you! The negative spaces, of course, why didn't I think of that? Love it, Ardyth! Amazing interpretation of this Pinterest photo. 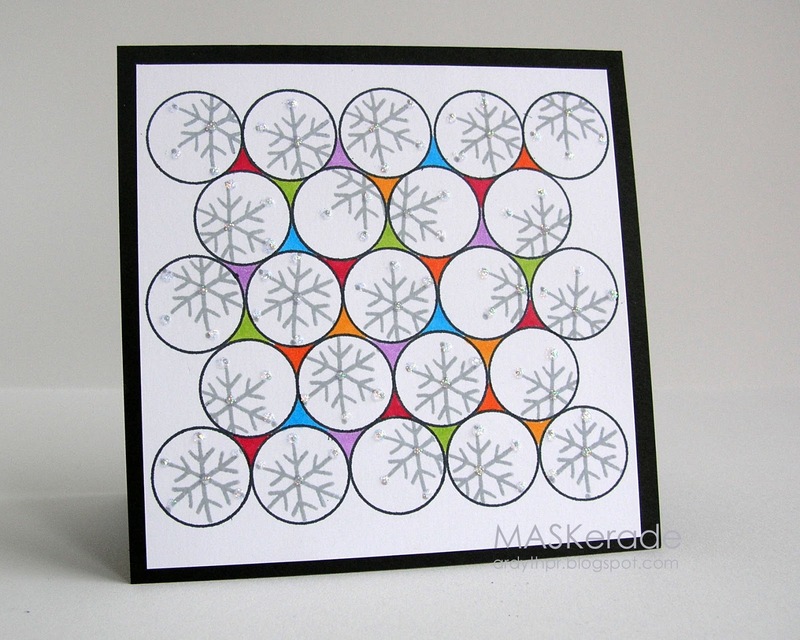 The colors between the circles is absolutely the perfect way to meld the snowflakes together! So fun! I love your Pinterest inspired cards - they're always amazing!